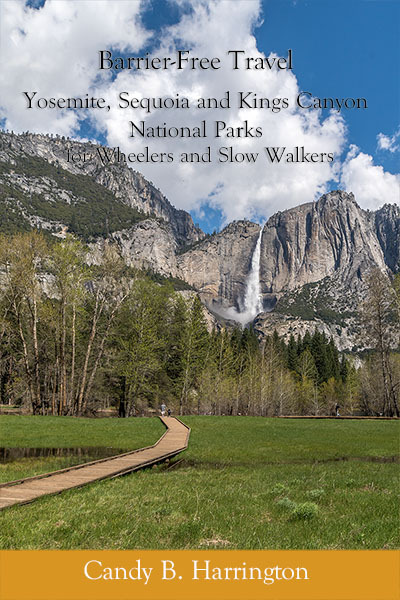 I’m thrilled to announce the release of my latest accessible travel title – “Barrier-Free Travel; Yosemite, Sequoia and Kings Canyon National Parks for Wheelers and Slow Walkers”. I had a great time researching this book – partly because I grew up in the area and I have fond memories of exploring Yosemite with my dad, but also because I now live close to the parks. And after 40 years of writing travel I’ve finally penned a book about my home turf! It’s about time. This title took a lot of research time, and to be honest some access improvements in the parks are still in the works as I write this post. That’s one of the great things about living close – I’ll be able to post updates on the access upgrades as they become available. But I have to say that for the most part, there has been a huge improvement in the accessibility of all these parks in the past 20 years. Granted, you can’t exactly ramp Half Dome (heck, able-bodied people keep falling off the cables up there), but there are a number of accessible trails and attractions in all the parks. I was also able to cover all of the in-park accessible lodging options, and even include some accessible choices from the gateway communities. And who knew there was an accessible cabin in Mineral King? Granted it’s a bit out of the way, but to be honest that’s part of its charm. And if you’re considering a visit to Yosemite, be sure and save time for Sequoia and Kings Canyon too. Most people totally overlook these gems, and they also have some nice accessible trails, attractions and lodging options. And if you’re not sure how to work it all in to your vacation, check out my suggested itineraries at www.barrierfreeyosemite.com/suggested-itineraries. Even if you’re just going to spend the day in one of the parks I have some great accessible suggestions there. So go ahead and add Yosemite, Sequoia and Kings Canyon National Parks to your travel itinerary, and prepare to have a fun – and very accessible — time. Oh, and if you are in need of accessible lodging details or information about the accessible trails and attractions in the parks, pick up a copy of “Barrier-Free Travel; Yosemite, Sequoia and Kings Canyon National Parks for Wheelers and Slow Walkers” at www.barrierfreeyosemite.com. This entry was posted in Destinations, Recreation, Road Trips and tagged access guide, book, california, kings Canyon, National Parks, Sequoia, Yosemite by Candy B. Harrington. Bookmark the permalink.